Through countless centuries a living connection between the earth and heavens was taken for granted. The metals were considered to have an inherent affinity with their parent planets, and represented a material expression of living cosmic energies. This article is extracted from Nick Kollerstrom's book The Metal-Planet Relationship, an extremely important work which, through scientific analysis and metaphysical reflection, ties the prosaic realm of rational science to the qualitative realm of essence and being. The book explores the natural correspondences that exist between the traditional planet-metal associations and, more importantly, details how modern experiment only serves to vindicate the relationships. He who knows what iron is, knows the attributes of Mars. He who knows Mars, knows the qualities of iron. Red storms rage across Mars. The soil of the red planet is high in iron, and its dust, swirling up into the atmosphere, causes giant storms that last for weeks. They blot out all its surface features, even the huge mountains. This can be quite a problem for craft trying to land there. One feels that these storms well express the Mars-quality of anger. Mars has around fifteen percent of iron in its surface soil, thrice its average level here on Earth. There must once have been lots of oxygen around, as all the iron is in the red, highly-oxidised (ferric) form. Mars has two rocky little moons, and one of them is destined to crash in the future, doomed to disitegrate, being too close to its parent planet. By meditating on these things one can experience the being of Mars. The archetype of Mars is fully expressed both in the red planet in the sky and in the metal iron under the ground. 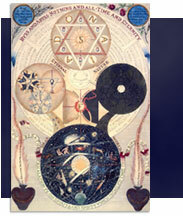 Thus, modern space discoveries have deepened our understanding of the primary Hermetic principle, as quoted above by Paracelsus. Of the seven metals, iron is the earthy one, having a stronger connection with the Earth than do the others  for a start, its the only one that aligns with the Earths magnetic field, in a compass. Its present in far larger quantities in the earths crust than the other classical metals. The others  lead, tin, gold, copper, mercury and silver  total no more than 0.01%, or one part in ten thousand of the Earths crust. They are in a sense little more than visitors to the Earth (the phrase is Dr Steiners), although we use them so much nowadays that we forget their scarcity. Iron makes up about 5% of the crust, being the only one which has built itself solidly into the substance of the earth. Reddish-looking soil means that iron is present, and, for the same reason, Mars is red. So the symbolism of Iron-Mars is direct and obvious, with nothing subtle about it. Mars has always been associated with blood and war because of this symbolism. But, lets not forget that that symbolism is also physiological fact: the blood is red because of the iron in it! The main ore of iron is pyrites, fools gold. Have some of its marvellous cubic-crystal structures on your mantelpiece! The other common ore is haematite, which has a quite different bulbous structure, and a dark reddish hue. Haem means blood and pyr means fire - blood and fire! These are indeed the Mars-attributes. Of the seven metals, iron is the one that burns. A falling star is burning iron. A meteorite burns brightly as it falls through the atmosphere. Fireworks use the burning sparkle of iron filings. Some steel wool can be ignited, then plunge it into a jar of oxygen, when it will glow fiercely. Thereby one experiences the fiery energy of Mars. One is reminded of Vulcan and Ares by such a demonstration, the two Mars-archetypes of antiquity. One was married to Aphrodite the Goddess of Love while the other just had an affair with her. Vulcan or Haephastos was the Smith, who forged the armour and instruments of war. The fiercely-glowing iron is removed from the furnace and then hammered into shape. Haephastos was lame, symbolizing an affliction that could befall Smiths from arsenic-poisoning. As copper and iron are bound together in the Earth, with most copper ores bound up with iron, as copper and iron interact in the blood, copper helping the iron metabolism  so Mars and Venus were mutually attracted. One sees this in the principle of a dynamo, where an iron-copperinteraction takes place to produce the throbbing pulse of electrical energy. Within the human body the fire-energy of Mars is seen in the metabolic process. Iron has a key role in the combustion processes within the tissues of the body, whereby food is turned into energy. Blood becomes red as the iron-containing molecule haemoglobin carries oxygen throughout the body. Thereby foodstuffs can be metabolised, as fuel for the organism. This same iron-molecule then absorbs the product of combustion, carbon dioxide, so the blood becomes blue, and carries it back to the lungs. In this breathing iron-process, which never ceases while life is present, there is the restless energy of Mars, as the blood rhythmically alternates from red to blue, from oxygen carrying to carbon dioxide carrying, moving away from the lungs then back again. As it does this, the unique iron-molecule haemoglobin continually changes its shape. Iron has the property of readily passing from one valency condition to the other, as connects iron with the rhythmic breathing process. One is 'anaemic' if one lacks iron in his blood; or, equally, it may refer to a lack of Mars-attributes in the character: strength, courage and will. Weleda make a meteoric iron remedy as is supposed to help with giving such strength to the will, for persons who feel a bit anaemic, or as if they cannot cope with lifes challenges. According to Mellie Uyldert, If they [anaemic people] eat nettles or spinach, their zest for life retuns, these plants being high in iron. I suppose that Popeye is a modern Mars-archetype, who gains his strength from eating a tin of spinach. As the Smith forged iron, with his hammer and anvil, so the development of the blast furnace required control over fire-processes. Iron has been closely involved with human history, as its strength gave men the power to dominate nature: 'The true Iron Age, led mainly by the peoples of the West, arises as a creation of iron and steel. Iron is harnessed to purely material goals. The shackles by which man has enslaved nature are forged of iron' (3). As you press down the pedal on the gas, an iron apparatus controls combustion. The Mars-metal iron unleashes masculine power. For the history of warfare, the development of hardened steel was pivotal, and is today today the element from which all weapons are made. An iron-and-coal girdle surrounds the Earth, through Wales, England, Germany, France, Russia and America. Today we live surrounded by iron and steel, and within this will find no cure for the rising tide of violence. We might however note the mystery of iron. Yes, iron has got a mystery. Comparing the black hue of your wrought-iron garden gate with the gleaming steel of the car bumper, can they really be the same element? A few percent of carbon turns one into the other, as reminds us of Irons strong connection with the Earth. Carbon the Earth-element makes all the difference to iron, giving to it the awful strength of steel. Cobalt, nickel and manganese are metals with iron-like properties. They are ferromagnetic, are used in steel alloys and in fireworks, and have comparable physical properties. Dr Rudolf Hauschka regarded them as being 'the brothers of iron'. Nickel alloys are vital for the tough, high-performance equipment in todays planes, trains, cars and boats, eg the turbines of a power-station. Most nickel produced goes into steel alloy, where it adds corrosion-resistance and strength. For example, Japan has a fast, magnetically-levitated train that zooms around Tokyo, and it utilises this alloy in various key roles. Nickel has an ability to absorb kinetic energy in the event of a collision and this contributes to the safety of passengers. These are all fine, Martial qualities. Nick Kollerstrom has a Cambridge science degree and has worked as a physics schoolteacher. He is recognised throughout the astrological community for his pioneering studies that have brough his scientific background into exciting fields of research on planets, plants and metals. He has been actively involved in the study of planet-metal associations and other matters of a Hermatic nature for 30 years, and has lectured on these subjects since 1975. His work in medical research resulted in his book Lead on the Brain - a plain guide to Britain's No 1 pollutant. His investigation of lunar effects upon plant growth led in the 1980s to his gardener's guide Planting by the Moon and the popular annuals Gardening and Planting by the Moon. Nick Kollerstrom's latest title, Crop Circles: The Hidden Form, published by Wessex books, offers a new way of experiencing the crop circle mystery, through the geometry of the forms revealed in crops.